Summary: The present case demonstrates that the blood oxygenation level—dependent (BOLD) signal intensity can decrease in the activated motor cortex on the lesion side (left) of a patient with a left frontal glioma during functional recovery after surgery. Near-infrared spectroscopy revealed that the decrease of BOLD signal was associated with increases of cerebral blood volume and deoxyhemoglobin concentrations in the cerebral vessels. This implies that the interpretation of results obtained by functional MR imaging in patients with brain disorders must take into consideration such atypically evoked cerebral blood oxygenation changes, which do not increase the BOLD signals. Blood oxygenation level—dependent (BOLD) contrast-enhanced functional MR (fMR) imaging depicts activated areas by detecting an increase of BOLD signal (ie, T2* signal), which is caused by a reduced concentration of deoxyhemoglobin (deoxy-Hb) in the cerebral vessels during activation (1). On the assumption that the normal brain and pathologic brain exhibit similarly evoked cerebral blood oxygenation (CBO) changes, fMR imaging has been employed to define the functional cortices in preoperative planning for tumor removal (2) or to evaluate the mechanism of functional recovery in brain disorders (3). Several fMR studies, however, have indicated that fMR imaging cannot accurately depict activated areas in some patients with brain tumors and cerebral ischemia (4–7). By employing near-infrared spectroscopy (NIRS), an optical method for measuring CBO changes, we have demonstrated that the false-negative activations on fMR images in the patients were associated with atypically evoked CBO changes; that is, increases in deoxy-Hb (7). In this report, we describe a patient with a left frontal glioma who showed a decrease of BOLD signal and atypically evoked CBO changes in the activated motor cortex during functional recovery after surgery. A previously healthy 27-year-old right-handed man presented with seizures but otherwise normal neurologic findings. Conventional MR imaging demonstrated a nonenhancing mass within the left frontal lobe (Fig 1, top). Preoperative cortical mapping via subdural grid electrodes revealed that the tumor had infiltrated the left motor cortex of the face and the upper extremity as well as Broca’s area. 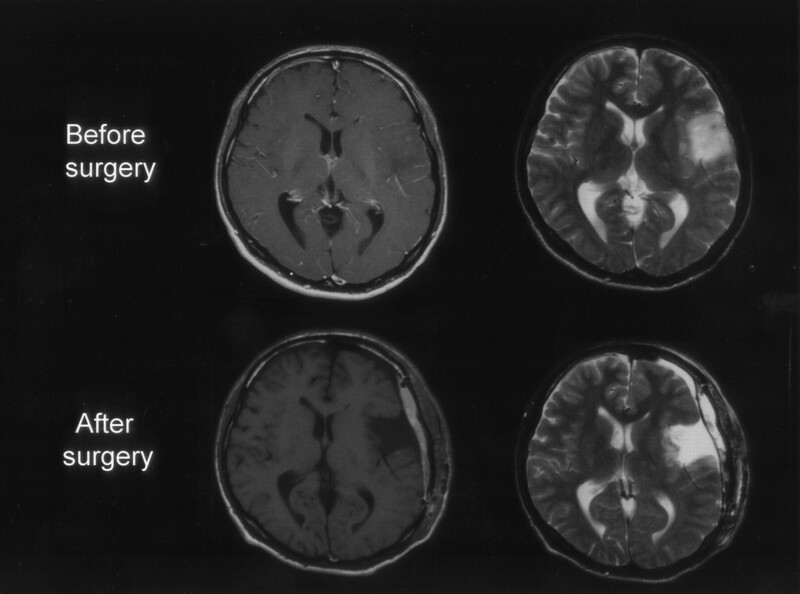 The tumor was therefore partially removed with care taken to avoid damage to the motor cortex and Broca’s area (Fig 1, bottom). Histologic analysis revealed a grade II astrocytoma. Preoperative gadolinium-enhanced T1- and T2-weighted MR images (top), showing a left frontal low-grade glioma. Postoperative gadolinium-enhanced T1- and T2- weighted MR images (bottom), showing subtotal removal of the glioma. fMR imaging was performed before resection of the tumor that mapped the activation of the right and left motor cortices during a contralateral hand grasping task. Postoperative fMR imaging was carried out 2 days and 22 days after the surgery. Two days after surgery, the patient could perform the task on the lesion side similarly to performance on the normal (left) side at the time of examination, although he had mild motor paresis of the right upper extremity immediately after surgery. The right motor paresis had completely disappeared 22 days after the surgery. NIRS measurements of evoked CBO changes in the motor cortex were carried out on the same days as those of the fMR imaging examinations. The methods of measurement of the BOLD signal and evoked CBO changes in the motor cortex were as we described in a previously published study (7). In brief, the BOLD signals were measured with a 1.5-T MR imager (Symphony, Siemens, Erlangen, Germany) employing an echo-planar technique (TE, 50 ms; TR, 4 seconds; section thickness, 3 mm; matrix size, 40 × 40; field of view [FOV], 192 × 192 mm). One hundred twenty frames of 40 axial sections (acquisition time per frame, 4 seconds) were acquired through the motor cortex during repeated motor task periods (40 seconds) and resting periods (40 seconds). We used BrainVoyager 2000 (Brain Innovation BV, Maastricht, the Netherlands) to calculate the activation maps; the statistical significance of changes in signal intensity was calculated on a voxel-by-voxel basis employing the Student t test. The task paradigm consisted of 40 seconds of rest and 40 seconds of self-paced hand grasping; this task-rest cycle was repeated six times. The patient was observed directly, to ensure that he carried out the task paradigm accurately and could perform the task on the lesion side similarly to the performance on the normal (left) side at the time of examination. We employed a NIRO-300 monitor (Hamamatsu Photonics K.K., Hamamatsu, Japan) to measure the concentration changes of deoxy-Hb, oxyhemoglobin (oxy-Hb) and total hemoglobin (sum of deoxy-Hb and oxy-Hb; total-Hb) in the motor cortex contralateral to the task performance. The NIRS probes were placed over the motor cortex contralateral to the side of task performance. The method for measuring the CBO changes in the motor cortex, which was as described in a previously published NIRS activation study (7), allows repeated NIRS measurements to be made of evoked CBO changes in the motor cortex of healthy adults and patients with brain disorders. The task paradigm was the same as that for the fMR imaging study. The patient gave informed consent to undergo all above-described procedures. Preoperative fMR imaging demonstrated robust activation in the primary motor cortex on the lesion side during the right-hand grasping task (Fig 2A, top). Postoperative fMR imaging undertaken 2 days after surgery, however, demonstrated negative BOLD signal changes in the motor cortex on the lesion side during right-hand grasping (Fig 2A, middle); the negative BOLD signal change was evident during the entire course of the task (Fig 2B, middle). In addition, extended activation was observed in the secondary motor cortex (the premotor and supplementary motor areas) on the nonlesion side. 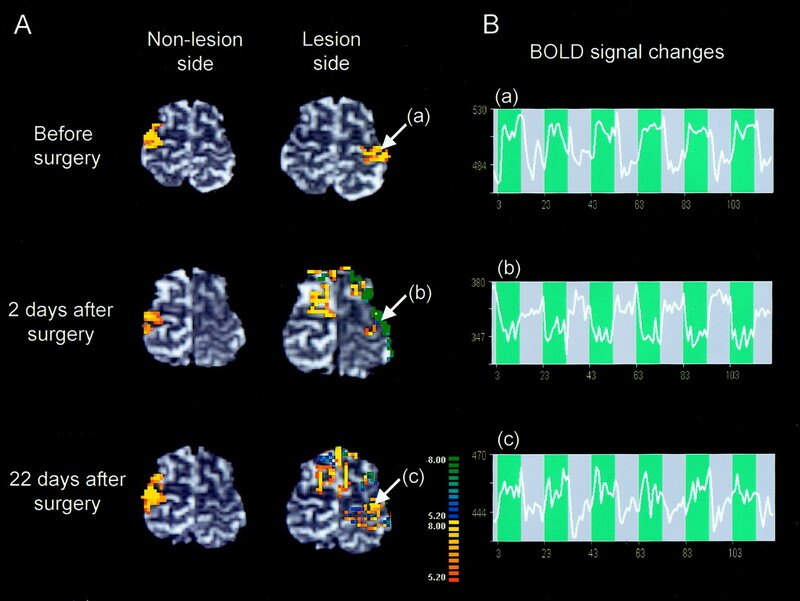 Postoperative fMR imaging performed 22 days after surgery showed that negative BOLD signal in the motor cortex on the lesion side decreased in association with an increase in activation areas (Fig 2A, bottom). By contrast, the left-hand grasping task activated the motor cortex on the nonlesion side consistently before and after surgery. Changes in fMR findings before and after tumor resection. A, Activation maps of BOLD fMRI for the right grasping task (lesion side) and the left grasping task (nonlesion side) before and after tumor resection. Postoperative fMR image 2 days after surgery demonstrated negative BOLD signal changes in the motor cortex on the lesion side. Extended activation in the ipsilateral secondary motor cortex was also observed after surgery. On the postoperative fMR image 22 days after surgery, the negative BOLD signal intensity areas in the motor cortex on the lesion side were decreased in association with an increase in activation areas. By contrast, left-hand grasping activated the motor cortex on the nonlesion side consistently before and after surgery. White arrows indicate the region of interest (a and c, positive signal-intensity changes; b, negative signal-intensity changes). B, Time course of the BOLD signal changes during the task (blue background). Preoperative NIRS demonstrated a decrease of deoxy-Hb associated with increases of oxy-Hb and total-Hb in the motor cortex on the lesion side during right-hand grasping (Fig 3, left); this evoked CBO change is consistent with the physiologic basis of BOLD contrast (1). The postoperative NIRS (2 days and 22 days after surgery) demonstrated similar increases of oxy-Hb and total-Hb in the motor cortex on the lesion side, which indicated regional cerebral blood flow (rCBF) increases in response to neuronal activation (Fig 3, middle and right). Two days after surgery, however, deoxy-Hb increased from the baseline during the entire course of the task, whereas deoxy-Hb did not change significantly (P > .05) 22 days after surgery. These alterations in deoxy-Hb correlated with the changes in size of the negative BOLD signal areas in the motor cortex on the lesion side. NIRS measurements of evoked CBO changes in the motor cortex on the lesion side before and after tumor resection. The ordinate indicates the concentration changes of the NIRS parameters in arbitrary units. The horizontal thick bar denotes the task period (40 seconds). Preoperative NIRS demonstrated a decrease of deoxy-Hb associated with increases of oxy-Hb and total-Hb (left), which is consistent with the physiological basis of BOLD contrast. 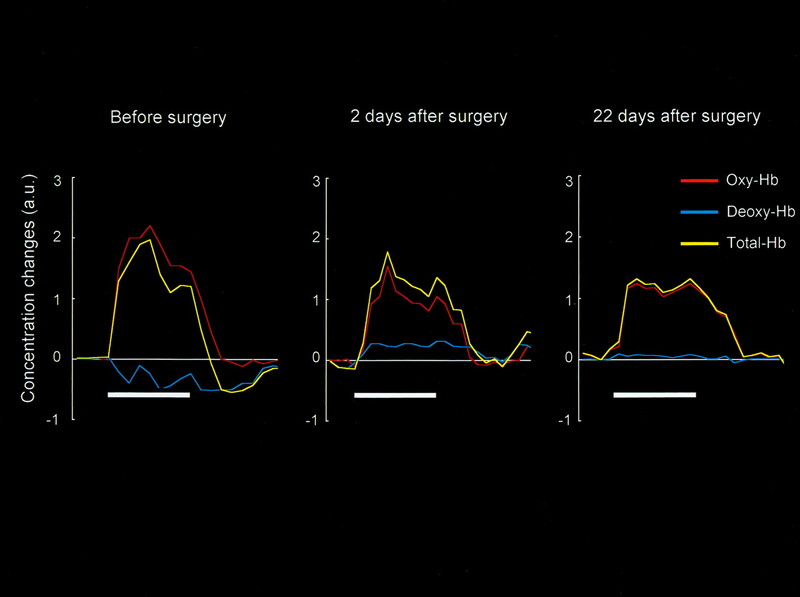 Postoperative NIRS (2 days and 22 days after surgery) demonstrated similar increases of oxy-Hb and total-Hb, indicating the occurrence of rCBF increases in response to neuronal activation (center and right). Two days after surgery, however, deoxy-Hb increased from the baseline during the entire course of the task, whereas deoxy-Hb did not change significantly 22 days after surgery. These alterations in deoxy-Hb correlated with the changes in size of the negative BOLD signal areas in the motor cortex on the lesion side (Fig 2A). NIRS is an optical method for measuring changes of oxy-Hb and deoxy-Hb concentration in the cerebral vessels by means of the characteristic absorption spectra of hemoglobin in the near-infrared range (8, 9). Changes in total-Hb indicate cerebral blood volume (CBV) changes and correlate with CBF changes under conditions of constant hematocrit and perfusion pressure (10). Thus, NIRS allows real-time changes in the CBO and hemodynamics at the activated area to be continuously characterized. By contrast, BOLD-fMR imaging measures only the concentration changes of deoxy-Hb, which is paramagnetic (1). It should be noted, however, that the spatial resolution of NIRS is poor because of light scattering in the tissues. NIRS measures the blood oxygenation changes within the illuminated area; thus, the NIRS parameter changes reflect the average changes of CBO within the illuminated area, which is much larger than the voxel size of BOLD-fMR images. In the present study, therefore, the CBO changes measured by NIRS indicated the average CBO changes in the part of the motor cortex through which the NIR light passed. The decrease of BOLD signals in the motor cortex seen on the lesion side after surgery was evident during the entire course of the task, so it differs from the “initial dip” occurring within a few seconds after the start of neuronal activation (11). Sustained decreases of BOLD signal—so-called deactivation—have been reported in several regions of the brain, including the visual cortex (12); however, they have not been observed in the motor cortex in normal adults. Recently, it has been demonstrated that deactivation is associated with a decrease of CBV (13). The decrease of BOLD signals in the present case therefore differs from the reported deactivation, because the increase of total-Hb measured by NIRS indicated an increase of CBV (10). The decrease of BOLD signal in the present case might have been caused by the deoxy-Hb rise during activation because deoxy-Hb is paramagnetic (1). The deoxy-Hb rise during activation could be caused by a decrease of oxygen delivery during neuronal activity. Quantitative models of oxygen delivery during activation have predicted that disproportionately large increases of rCBF are required to produce small increases of cerebral metabolic rate for O2 (14). Thus, a small decrease in rCBF response to neuronal activation can give rise to oxygen deficiency during activation. In the present case, in light of the possible surgical injury, the motor cortex on the lesion side might have been in an ischemic condition, which could have caused increases in deoxy-Hb during activation (7). NIRS activation studies have demonstrated a similar increase of deoxy-Hb during activation in patients with cerebral ischemia (7, 15). Sakatani et al (15) found that, in many poststroke aphasics, language tasks caused an increase of deoxy-Hb with increases of oxy-Hb and total-Hb in the left prefrontal cortex. We recently observed similarly evoked CBO changes in the motor cortex of patients with cerebral ischemia (7). It is interesting that neonates have been reported to exhibit an increase of deoxy-Hb with increases of oxy-Hb and total-Hb in the activated areas (16, 17), where BOLD signals decrease during activation (18); it was suggested that the increase of deoxy-Hb was caused by an increase of oxygen consumption in the developing brain (18). Recent fMR imaging studies have demonstrated false-negative activations in patients with brain tumors (4–6) and cerebral ischemia (7). Loss of vasodilatory response to neuronal activation is thought to be a major contributing factor (4–6). In the present case, however, the vasodilatory response to neuronal activation must have been preserved because the oxy-Hb and total-Hb were significantly increased during activation. We suggest that the false-negative activation in fMR imaging was caused by the atypically evoked CBO changes (ie, an increase in deoxy-Hb) and the software employed to calculate the activation maps. That is, most of the software packages do not regard an increase of deoxy-Hb (ie, a decrease in BOLD signal) as neuronal activation, thus leading to false-negative activation on fMR imaging. Postoperative fMR imaging demonstrated extended activation in the secondary motor cortex on the nonlesion (right) side during the right-hand grasping task. Similar ipsilateral activation has been observed on the affected side in patients with chronic stroke performing motor tasks; this has been interpreted as functional reorganization (3). In the present case, however, the ipsilateral activation was observed shortly after surgery; it is unlikely that anatomic reorganization had occurred after the surgery. It has been hypothesized that brain infiltration by glioma may lead to a reshaping of functional networks, which could explain transient postoperative neurologic deficits (19). If only positive changes of BOLD signal were analyzed after surgery in the present study, this hypothesis may explain the rapid functional recovery seen after surgery in the present case; however, the occurrence of a vasodilatory response to neuronal activation strongly suggests that the motor cortex on the lesion side was functioning at the time of examination. The ipsilateral activations in the secondary motor cortex therefore might have played a minor role in the functional recovery in the present case. A positron emission tomography study on poststroke aphasics has demonstrated that activation in the nondominant hemisphere does not play an important role in recovery of the aphasia (20). It should be emphasized that, without detailed clarification of the oxygen metabolism during neuronal activity and vascular reorganization in the pathologic brain, fMR imaging could overlook activated areas in patients with brain disorders, leading to incorrect conclusions concerning functional reorganization. Comparisons of fMR imaging and NIRS may be useful for avoiding such misleading impressions. Supported by a grant-in-aid from the Ministry of Education, Culture, Sports, Sciences and Technology of Japan (grants A12307029, A15209047, C15591553 and a grant for the promotion of industry-university collaboration at Nihon University) and by Hamamatsu Photonics K.K. (Hamamatsu, Japan). Accepted after revision November 20, 2003.